The Chief of Air Staff, Air Chief Marshal Arup Raha went on a two-day visit to assess the progress and take stock of ongoing projects of Units under Maintenance Command at Nasik and Bangalore. He also visited both the Divisions of HAL at Nasik and Bangalore. The Air Chief was accompanied by the Secretary, Defence Production, to provide an impetus to enhanced co-ordination between HAL and IAF in managing all aircraft projects under HAL. This visit gains significant importance since the Indian Air Force’s operational capabilities are dependent on HAL. On arrival at Nasik, the Air Chief and Secretary, Defence Production, were received by Air Cmde. S. Padegaonkar and were briefed on the activities carried out by this important Maintenance Support Base. 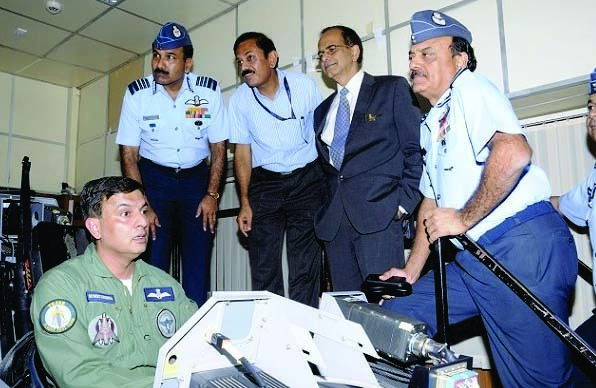 The Air Chief also saw the state-of-the-art equipment and infrastructure of the BRD. The CAS and Secretary DP also visited the HAL Division at Nasik, where they were received by Chairman HAL, Dr. R. K. Tyagi. This HAL Division is involved in license manufacturer of SU-30, Repair, Overhaul and Upgrade of MiG Series aircraft, aggregates and rotables. It supplies spares and consumables as well as provides life extensions, modifications, site repairs and investigations. At 25 ED, the Air Chief visited the Materials Management Institute of the Indian Air Force. Chairman HAL accompanied the CAS and Secretary DP to Bangalore. At Bangalore, the first visit was to the HAL Aircraft Division, where there are several ongoing projects like the LCA, Hawks, Jaguar Upgrade and LCH. During these interactions, since HAL is a major stake holder in IAF’s modernisation plan, Indian Air Force projects will get a new boost. This was followed by a visit to 26 ED. This Equipment Depot has the main objective of providing repairable units and spares. It is an effective interface between the Indian Air Force and HAL and handles a variety of Weapon Systems. The Chief of the Air Staff, Air Chief Marshal Arup Raha, along with HAL Chairman R. K. Tyagi also visited the HAL Iron Bird Facility at the Aircraft Research and Design Centre (ARDC). Iron Bird is the final platform where all the issues of LCA Tejas Flight Control Systems (FCS) are resolved to ensure safety of the flight. The Chief of the Air Staff inspected the facility, where more than 14,370 hours of software testing of LCA Tejas has been completed till date. “It is a unique facility and an asset to the LCA Tejas programme. Using this facility, tests can be carried out under normal and failure modes for complex aircraft systems,” said R. K. Tyagi, Chairman, Hindustan Aeronautics Limited (HAL).